St. Mary’s alum is in the thick of the public debate about how changing Hispanic demographics are influencing policy and politics in the U.S.
Let me start by tossing a few numbers at you. In the November 2012 presidential election, 68 percent of eligible black voters cast a ballot, compared to 64 percent of eligible white voters. It was the first time since the U.S. Census began tracking this information that a minority group had a higher participation rate than white voters. Meanwhile, just 48 percent of eligible Hispanic voters — who are part of the largest minority group in the U.S., and growing — cast a ballot. Even with lagging participation rates, Hispanic voters were a deciding factor in the presidential race, and the surging Hispanic population is expected to become an even more powerful political force in the coming years. The Pew Research Center predicts that the Hispanic electorate will double by 2030. The median age for Hispanics is 27 — and just 18 among U.S.-born Hispanics — while the median age for white non-Hispanics is 42. That means generational replacement alone will propel Hispanics as a voting bloc; if they begin participating at higher rates, their influence will be magnified. 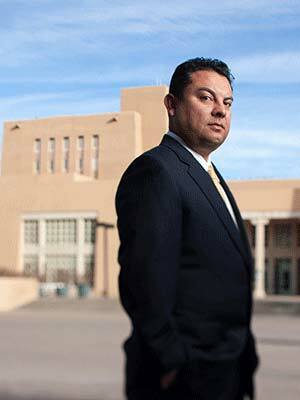 The role of Hispanics in U.S. policy and politics first caught Gabriel Sanchez’s attention while he was a Political Science major at St. Mary’s University. Now, as research director at Latino Decisions, a national polling firm specializing in Latino voter trends, his focus on public policy and Hispanics has uniquely positioned him to understand and translate the often-emotional public debate about policies and people. I spoke with Sanchez by phone about his work and how issues affecting Hispanics impact policy decisions. Q: National polling firms have existed in the U.S. for generations. What was the need for a firm focused on Latino voters? A: We felt like we were filling a void. The other pollsters don’t have a good sense of how to poll and analyze Latino-specific data. For example, they don’t do fully bilingual interviewing, and they often don’t understand the nuances of the community. It matters how you ask the question. There was another piece that was always frustrating to us: Turn on the TV or listen to the radio, and you hear a non-Latino expert talking about Latino issues. The cool thing about Latino Decisions is that, for the most part, we are all Latinos who have been to graduate school and are trained in Latino politics. Q: Why is it important to look specifically at Latino voters? A: The “browning of America” — the increase in Latino and minorities as a percentage of the total population — had been happening for a while. But what has changed now is not just the population numbers, but where Latinos reside. Often, when I’m in groups where people are deciding health policy, I’m the only Latino in the room. Our center aims at changing that reality. In the past, the biggest chunks of Latino voters were in the states you would expect — California, Texas — states where this voting bloc didn’t matter in the context of the Electoral College, because the states were set as Democratic or Republican. But when states like Colorado, Nevada and Florida, and even some states you don’t normally associate with Latinos, like North Carolina or Ohio, began seeing larger numbers of Latino residents, it started to matter in how elections turned out. Although people assume Latino voters are Democrats, they tend to be swing voters. For example, George Bush in 2000 and 2004 got roughly 40 percent of Latino voters in each of his election cycles. If Romney had received anywhere close to that in 2012, he would have won. Q: What issues matter to this surging demographic group? A: For the most part, Latinos have the same priorities as the mainstream — education, health care, the economy — but there are nuances. We’ve polled a lot on the Affordable Care Act — starting during the debate until now — and an overwhelming percentage said that undocumented residents should have access to the state or federal health care exchanges. That is much greater support than the non-Hispanic population’s view of this issue. This role of ‘immigrant politics’ influences their policy preferences. Q: Numerous states have passed laws with photo voter ID requirements (34 as of April 2014, including 12 considered “strict”). Why is this controversial? A: The typical thing you hear is, what is the big deal? You need an ID to rent a movie. But documented cases of in-person voter fraud are actually very rare. The big problem is that where it does occur, it isn’t people walking into a voter precinct pretending to be someone else, it is someone manipulating the mail-in vote system. Voter ID laws don’t do anything to prevent that. We also assume almost everyone has a driver’s license, but it tends to be biased in terms of socio-economic status. Poorer people, older people, and minorities are most often the ones who lack a photo ID. Additionally, it’s not just about having a photo ID but having one that exactly matches how they are listed in voting records. If the name doesn’t exactly match — missing a hyphen, a nickname (Gabe versus Gabriel) or with a misspelling — they may be unable to vote even though it is not fraud. Getting a new card requires time, effort, sometimes money, and that carries the same race and class bias. A basic accepted truth of political science is that when you change voting laws and systems, it’s the most vulnerable sections of the population that are harmed. As an example, our research found that in Wisconsin — which passed a strict voter ID law in 2011 that was later overturned — eligible African American voters were 182 percent less likely to have an accepted photo ID than whites, and Latinos were 206 percent less likely. Q: How does your work as executive director of the Robert Wood Johnson Foundation Center for Health Policy correlate to this idea of ensuring Latinos are fairly represented in politics and policy? A: Our center is really unique. Its mission is to produce minority Ph.D.s who are trained specifically in issues related to health disparities among minorities. Success is hard to measure — it takes so much time and energy to get someone through a Ph.D. program. But it’s important. Often, when I’m in groups where people are deciding health policy, I’m the only Latino in the room. Our center aims at changing that reality by producing the next generation of diverse leaders who will help create better health policy.